LG is bringing its Cinema 3D tech to computers with the new D41P and D42P families of monitors. The 1920 x 1080 displays range in size from 21.5-inches to 25-inches and feature the company's FPR (Film Pattern Retarder) coating that ditches the heavy active shutter glasses used by many other manufacturers for the lighter passive variety. Both monitors also sport a 5ms response time, an HDMI 1.4 port, and a 2D conversion feature -- perfect for whipping up Word docs in eye-popping 3D. Pricing is still up in the air, but the D41P and D42P lines are available in South Korea now and a global rollout will begin in June, with Europe next in line for some flicker-free 3D fun. PR and one more image after the break. SEOUL--(Korea Newswire) April 26, 2011 -- LG Electronics (LG) today announced the release of two CIN-EMA 3D Monitors –D41P and D42P – equipped with LG's new Film Patterned Retarder (FPR) 3D technology. With FPR 3D technology, the monitors offer a brighter display, clearer images, and a "Flicker-Free" certified 3D picture that makes 3D viewing more comfortable. "Although 3D is one of the hottest items in technology today, some consumers are holding back from purchasing 3D products because of concerns over performance and price," said Si-hwan Park, Vice President of the Monitor Division, LG Home Entertainment Company. "With CINEMA 3D Monitors, we've addressed all these concerns. The advanced picture quality, more comfortable glasses and competitive pricing makes it very hard to keep put-ting off 3D." The monitors' "Flicker-Free" certification, shared with LG's CINEMA 3D TVs, was awarded by TÜV and Intertek, two of Europe's top safety certification agencies. 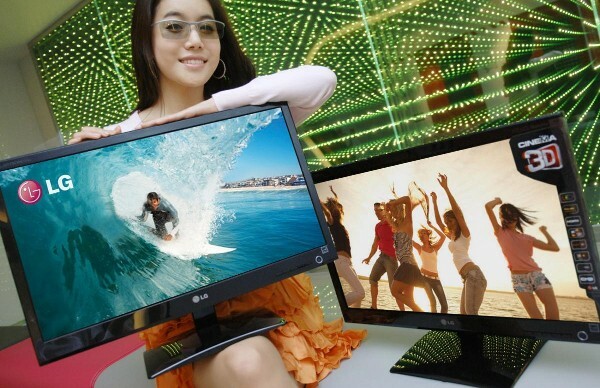 The certi-fication recognizes that LG's CINEMA 3D Monitors have largely eradicated onscreen flicker, which had occasionally caused dizziness and nausea among viewers watching conventional 3D displays. With CINEMA 3D Monitors, viewers are now able to watch 3D content for longer periods in greater comfort. Thanks to LG's FPR technology, LG CINEMA 3D Monitors also provide clearer, brighter 3D images and lower crosstalk, meaning less eyestrain. In contrast with conventional 3D glasses, LG CINEMA 3D glasses are lightweight and entirely free of electrical parts, so and the glasses are lighter – thus more comfortable – and they never need to be recharged. LG CINEMA 3D Monitors also boast great compatibility. The monitors work with all graphic cards and are compatible with popular home PC operating systems. They support HDMI 1.4 for easy hook-up with other 3D devices, making it possible to play 3D content without a PC. Also, a 2D to 3D conversion function converts regular content into top-quality 3D on the fly, so viewers will never be short of 3D content to enjoy. In addition, a recent detailed survey conducted in five markets by Research Company TNS found that 77 percent of respondents expressed a preference for FPR type 3D monitor based on image quality, comfort and convenience of glasses. The survey involved blind testing after the product demonstration of almost 230 consumers across both Shutter Glass (SG) type and FPR type 3D monitor with respondents viewing a series of 3D video clips on each screen. The LG Cinema 3D Monitor will be launched in Korea today and will be rolled out globally early June starting in Europe.